"Chronicle," the latest found footage thriller, stars Dane DeHaan, Alex Russell and Michael B. Jordan as three Seattle teens who happen upon a mysterious crystal smoldering at the bottom of a weirdly deep and winding crater. Shortly after inspecting the bizarre object, the boys discover themselves to be in possession of amazing telekinetic powers, able to make objects and people move about with the flick of a wrist. But as is so often the case when three people come to posses something valuable/powerful, one of them has to drift slowly over to the dark side. And once you can move things with your brain it's a slippery slope from pulling the legs off of spiders to murder. When "The Blair Witch Project" kick started the found footage movement, part of the genre's charm was watching directors contend with the challenge of getting their story on film while keeping the camera angles at least passably organic. 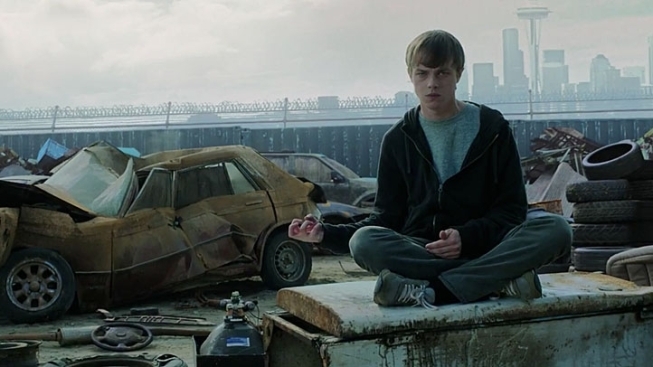 Part of the genius of "Chronicle" is that because the boys are telekinetic, they can just make the camera float wherever it's needed--and because they're melodramatic teens, they tend to do go for things like God's-eye-view shots that help set the appropriate tone. Brilliant. The film is at its most fun and charming when the guys are just beginning to learn the extent of their powers, doing the kind off dumbass stuff you'd imagine Johnny Knoxville and friends would try. They stab each with forks, terrorize shoppers in a toy store and toss around a football at 30,000 feet, throw rocks at each other's faces... They are essentially superheroes with the imagination and urges of children. As fresh, clever and fun as much of the film is, director Josh Trank and co-writer Max Landis (son of John Landis), they unfortunately fall prey to some of Hollywood's most tired conventions. Andrew is of course scrawny and unpopular, a virgin, whose mother is dying of (presumably) cancer and whose father is an alcoholic ex-firefighter living on disability checks... Just once, couldn't the kindhearted and beloved class president be the one who goes off the rails? Wouldn't that make for a far more interesting discussion about good and evil, and what compels us to maintain our moral center? "Chronicle's" climactic battle is a blast, bringing to mind nothing so much as the Times Square boogeydown between Superman and General Zod, as the combatants zip across the sky over Seattle, pile-driving each other through buildings and tossing around cop cars like so many Hot Wheels. Like "Monsters" director Gareth Edwards before him, Trank does an impressive job of making a very expensive-looking film on the cheap. "Chronicle" opens in theaters everywhere Friday, February 3rd.